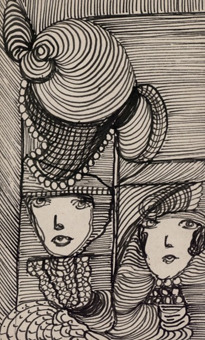 Madge Gill: Medium & Visionary is showing until 26 January, 2014 at Orleans House Gallery. With no training and no aspirations to fame, Madge Gill produced thousands of ink drawings during her lifetime. This major retrospective exhibition features over 100 original artworks, and contextual photographs and documents. Working mainly on paper, card and textiles, Gill used pen to create maze-like surfaces that often reveal a female face. The exhibition includes The Crucifixion of the Soul, which is Gill’s most important work. Over ten metres long, the calico is inscribed with finely wrought doodle-like drawings and is testament to Gill’s commitment to creativity. Bringing together little-seen loans from the Newham Archive; the College of Psychic Studies in South Kensington; the Henry Boxer Gallery and other archival material and artworks from private collections, the exhibition is a must-see for those interested in art, psychology, spiritualism, social history or all of the above. Gift Subscriptions still available for Christmas - click here to order! 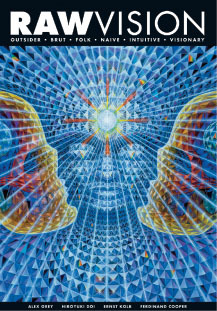 Alex Grey's life and art, with an extract from his new book. Ferdinand Cooper's unusable imitations of objects. Patrick Joyce's peripheral visions of a mythological world. Intense paintings by master porcelain painter Josef Karl Rädler. Hiroyuki Doi's compositions made up of many miniscule circles. Art in British mental health institutions since the 1800s. The visionary environment of Prophet Isiah Robertson. 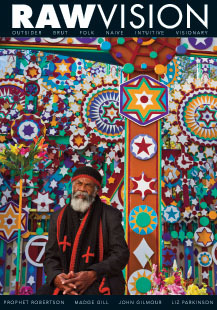 An interview with Chuck Rosenak about his life of collecting American folk art. The heretical bestiary of Friedrich Schröder-Sonnenstern. The ornate faces of Australian outsider Liz Parkinson. The nineteenth century watercolours of patient John Gilmour from the Chrichton Royal Hospital, Scotland.